How does the PowerCurve sensor work? Repeatable results by measuring the press-on force between the wheel and the trainer. Differences in press-on force can account for discrepancies of 50 watts or more. With a coast down test it is possible to measure the press on-force for repeatable results. Depending on the weight of the flywheel and the resistance of the trainer, different models will have different coast down calibration reference times. The trainers supported by the PowerCurve Sensor all have been calibrated with an appropriate coast down reference time. The load curves have been measured with a PowerTap at 8 or more different data points. Then with a mathematical third order polynomial curve fitting algorithm the precise load curve is established. 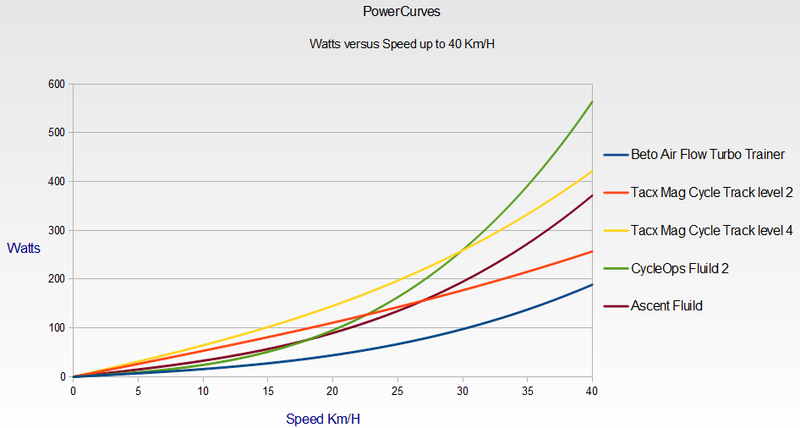 Below is a graph showing a close up of the load curve for various trainers up to 40 Km/H.